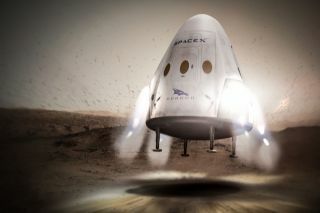 Artist's illustration of SpaceX's Dragon capsule landing on Mars. Elon Musk is set to unveil SpaceX's ambitious Mars colony plans today (Sept. 27), but not everything he says will be a big reveal. Musk will discuss how the company aims to help establish a permanent human settlement on the Red Planet, during a talk today at the International Astronautical Congress meeting in Guadalajara, Mexico. You can watch the presentation live, beginning at 2:30 p.m. EDT (1830 GMT), live here at Space.com, courtesy of SpaceX, or directly via SpaceX here http://www.spacex.com/webcast or here https://www.youtube.com/user/spacexchannel. Here's a brief rundown of what we know so far. SpaceX wants to launch its first Mars mission less than two years from now, in May 2018. The company aims to land one of its uncrewed Dragon capsules on the Red Planet, mainly to test out landing systems and other key technologies that human Mars missions will require. Perhaps the most critical of these is "supersonic retropropulsion." Dragon will slow down from supersonic speeds in the Martian atmosphere not by deploying a huge parachute, as previous missions have done, but by firing onboard thrusters against the path of flight. NASA views supersonic retropropulsion as critical to crewed Mars efforts, which will have to set multi-ton payloads such as habitat modules down on the planet's surface. This explains why the agency — which aims to put boots on Mars sometime in the 2030s — is providing technical support (but no funding) for SpaceX's 2018 "Red Dragon" mission. "Essentially, what we're saying is [that] we're establishing a cargo route to Mars," Musk told The Washington Post in June. "It's a regular cargo route. You can count on it. It's going to happen every 26 months. Like a train leaving the station. And if scientists around the world know that they can count on that, and it's going to be inexpensive, relatively speaking, compared to anything in the past, then they will plan accordingly and come up with a lot of great experiments." In 2020, the company plans to launch two uncrewed Dragon capsules using two Falcon Heavy rockets (the same type of vehicle that will loft Red Dragon in 2018), Musk said. The 2022 effort will also be uncrewed, but it will employ an entirely new spaceflight system: SpaceX's Mars-colony architecture, which Musk recently christened the Interplanetary Transport System (ITS). The reusable ITS will consist of a spacecraft and a super-heavy-lift rocket. That rocket will be powered by a new engine called Raptor, in contrast to SpaceX's Falcon 9 and Falcon Heavy launchers, which employ Merlin engines. Not much else is known about the ITS. Musk has said he'll unveil the system today during his presentation at the International Astronautical Congress (IAC) in Guadalajara, Mexico. Musk has said he wants the ITS to fly a handful of people to Mars as early as the 2024 launch window. But his overall vision for the Red Planet is much more ambitious: He said he wants to help establish a stable, permanent and self-sufficient colony, to hedge humanity's bets in case something terrible happens here on Earth. How many Mars pioneers will it take to make this vision a reality? In 2014, Musk told Aeon magazine that 1 million people would probably do the trick. It might take 100,000 trips to build the colony up to that level, Musk added, but he expressed confidence that it could all happen within 100 years. How's he going pull that off? Tune in today and find out.